This graphic below sums up how my overall portfolio is currently invested sectors wise. This is not where I would like it to be, this is how it is as of today. All in all, I'm quite satisfied with how diversifiy my portfolio is and how my different sectors are allocated. I now own more than 17 companies, which is a little more than I would have wanted in the beginning (I was aiming for 12-15). But, coming off a very long bull market, I find it hard to add stocks (relatively cheap) to my actual holdings. Hence, the new buys I have made this last year. I have to say, I like my new additions : Nova Scotia Bank (BNS), Alimentation Couche-Tard (ATD.B), Verizon (VZ), BCE (BCE), Therapeutics Knight (GUD), and more recently ATCO (ACO.X). Moreover these new acquisitions are all in different sectors : Finances, Consumer, Telecom, Pharma/Penny Stock and Energy. The Bond sector is part of my portfolio risk-free section. Like I said, I have contributed in the past in a former employee's pension plan. This money is dead-lock until I am 60 years old. It thus represents the security side of my portfolio, along with the bonds. Therefore, I don't need to have a big % allocated to secure and fixed-revenue income. Since I periodically invest a small amount in bonds, this % could reach 7 $. That's more than enough. The Finance sector is very well represented with the likes of Royal Bank (RY), Power Corporation (POW), Power Financial (PWF) and Bank of Nova Scotia (BNS). I like this group of companies and apart from some small changes my Finance allocation should remain close to 15-16%. The Cash sector, like the bond one, is a risk-free sector. The % is quite high at the moment, but given the long bull market we have, and unless there's a major correction soon, it will stay like that for a while. Eventually, I d'like it to be around 15% of my portfolio. I like the Telecom sector, but it took me a while to make an entry. I have small positions in BCE (BCE) and Verizon (VZ). I would like to add some more of their shares. But it will have to wait a little. I need to crank up my % in this sector to 7% (or even more). No doubt, energy is the most volatile sector in my portfolio. Whatever we say about it, we can't seem to be doing much without oil or electricity nowadays. I don't see that changing anytime soon. Again, like my Finance Sector, I like the big names here : Fortis (FTS), Suncor (SU), ConocoPhilipps (COP) and the recently added Atco (ACO.X). 12 % of my portfolio for this sector seems about right. This sector, Transport, is basically railway transportation in the likes of Canadian Pacific (CP). I would like to own some more of CP, but the stock, at 230$ (and counting) isn't cheap. I'd like to add to this position and eventually have a sector allocation of roughly 8% (or even 10% if I can get my hands on its competitor, Canadian National Railway (CN)). Index Funds are a not a sector per se. 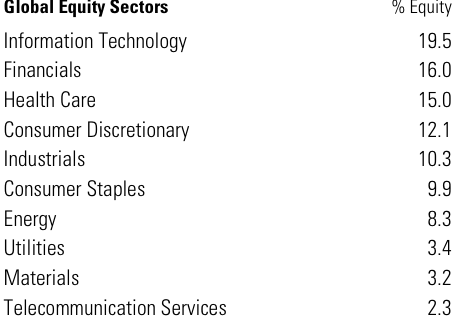 Through this particular US index fund, I'm invested in a few sectors, mainly these shown in the graphic below. (I guess, I'm involved in Information Technology after all!) I'm invested in this fund via a periodic purchasing program. It simple, free of commission and effective. I might sell this fund and buy stocks directly when I feel a have a big enough lump sum. Right now it represents not even 3.5% of my portfolio. As you are aware by now if you visit this blog from time to time, I've been a very sad shareholder of Barrick Gold (ABX). (Yes, I'm losing money over it. Damn!) I sold a few shares lately and if the stock picks up a little, I might sell some more. A 3 % Gold allocation seems more than enough for my taste. Again, like Transport and Gold, the Health sector is represented by a sole company. But unlike the gold sector, it's a solid one, Johnson and Johnson (JNJ). This company is one of my oldest and favourite stock. As a rule of thumbs, we often hear that we shouldn't hold a stock that's accountable for more than 5-6% of one's portfolio. This one is accountable for more than 10! It's ok, my mind is at ease with JNJ. It will stay like that. Real Estate should always be part of a diversified portfolio. The thing with Real Estate Income Trust is that you never know if a government is going to change its policies towards them; making it less attractive without their fiscal advantages. I'd say it's healthy to keep REIT below 3%. Don't you love their juicy dividends? I sure like my Cominar (CUF.UN) investment. What do you think of my Portfolio Sector Allocation? Would you tweak it differently? Or get rid of those speculative companies? What would you do? I want to hear from you. Sorry for the little absence. A man has to work in order to invest once in a while! So I was caught up with work, which is a good news I guess. Keep the money coming in. But it leaves me a little bit less time to document my financial journey towards financial independence. And you all know I want to succeed. Every time I discuss finances with people I know (or don't know), I feel much more equipped than before. Stocks, mutual funds, bonds, ratios, etc. were all foreign concepts for me. Not anymore. I don't pretend I'm a big specialist or anything like that. I guess I am only able to speak the language of finances. That makes a big difference. We habla mano a mano. Now that I know more about that subject, it stupefies me when I hear stuff that doesn't make any sense, especially coming from people that work in the financial industry. For instance, I suggested to my dad to open up a TSFA (Tax Free Saving Account). He didn't have one. If you are Canadian, this particular financial tool is perhaps the greatest invention since the birth of Hockey Legend Mario Lemieux. You are allowed to put roughly 5 K$ in that account. Whatever happens with this money is tax free. You can invest in just about anything : bonds, stocks, funds, you name it. You can withdraw your money anytime. And, like I said, it's Tax Free. That's pretty much the gist of it. So, since TFSA'a have been put in place in 2009, you can put as much as 36 500$. That's a pretty decent number. Anyway, my dad, who's pretty much clueless regarding finances, was trying to set up a automatic purchase program in its TFSA. It was a minor contribution of 100$ per two weeks. Basically, he wanted to split it's contribution to 50$ in a (boring yet secure) term deposit and 50$ in a US Index Funds. The latter fund "invests primarily in the same securities and in the same proportions as the benchmark index. The benchmark is Standard & Poor's 500 (S&P 500) Total Return Index (CDN$)". Apple, Microsoft, Exxon Mobile and Johnson and Johnson are some of the 500 and more holdings. But guess what? The guy was adamant that my dad's investment was not diversified enough. Not enough! I understand that these guys follow policies, investors profile and all that. But geez whiz, come on. He was setting up a 100 $ per 2 weeks program. He wasn't buying a chunk of a speculative company with his lifetime's earnings. I also get the fact that these guys are told by banks to sell more of their funds. Hence the idea of this particular guy to add a few funds for diversification sake. At this point, I had to intervene. (I was next to my dad). (me) - Hello Sir. I'm the son. What seems to be the problem? - Well, I think this approach is a little risky for your dad. This fund can fluctuate a lot, you know. (me) - Yeah, we know. He knows and he is willing to take the risk. That's why half of his contributions will be secure in a term deposit. - Why do you want to be solely invested in the US? (me) - It's only for a starter. Eventually, when he's managed to have a sizeable account, say 5 K$, we will consider other options. But for now, he would like to invest in the US. - Well, I worry about the diversification of concentrating in one region. (me) - Sir, there's like 500 and more companies in this fund that operate around the globe. Do you think Johnson and Johnson, for instance, isn't doing business overseas? (me) - Can you set him up with this low-cost Index fund? And eventually will think about purchasing some more of your high fees mutual funds. Ok? - Yes sir, right away. The point is : someone with no knowledge whatsoever would probably have bailed out by then and decided to buy those 2-3 expensive mutual funds in ordre to obtain this "diworsification" for a 50$ per 2 weeks contribution. Silly. There's a fine line sometimes between a financial sellers and a financial advisers. I'm not sure a lot of people see the difference. My dad didn't. But hopefully I did. Speaking of selling, I know it's totally opposite of what a dividend investor should normally do but I sold some of my shares in two companies I own. Barrick Gold (ABX.to) : the Canadian mining giant is like a stone in my shoe. This is where I have invested the more money (hello!). It would be too long to list the bad things this company has done in the past couple of years. I almost lost confidence in them. Anyway, the shares picked up a little bit last week and I decided to sell 50 of them. It's not a lot. But, of course, I lost money. It's part of the learning process, right? If the shares kick up again, I might sell more. Power Corporation (POW) : some of you will be surprised to learn that I have sold some of my shares in POW. This a gem of a company and one of my oldest and biggest holding. I only sold 25 shares. POW was trading at an all-time high for that past 3-4 years. I seized the occasion. Why ? Well it's because I recently had initiated a position in its little brother Power Financial (PWF). So, all in all, I had 425 shares in these two companies, which represented more than 9 % of my portfolio. I wanted to take that % down a little bit. The only company I can deal with a higher % is Johnson and Johnson. 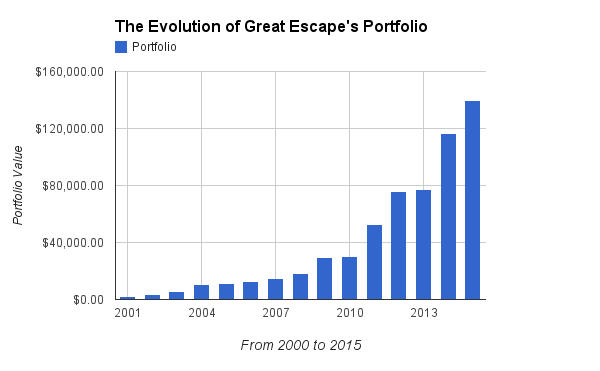 Eventually, I would like to limit the investment I have in one company to 5% of my portfolio. So that's pretty much it for me on the financial front. Again, I have cash available for shares purchasing. Still need a little correction to move though. What do you think about selling some shares of yours? Like I said in the first part of "My most performing stocks" post, I had the good fortune to buy a few good companies at the right moment. It was the case for Kraft (KRFT) (thank you Warren Buffet for the idea), Royal Bank of Canada (RY) (thank you my bank for charging me fees I can pay with your dividends) and Canadian Pacific (CP (thank you Hunter Harrison for making this company great). These stocks have done extremely well. Not only did they provide me with some nice dividends over the years, their prices have gone up 25% and sometimes more. Three other names come to mind when I think about my other superstars stocks. If you come here often, you know by now JNJ is my favorite stock. It's got everything : diversification, excellent credit, half of its earnings come from outside the USA, a growing and steady increase of its dividend (more than 40 years in a row), an excellent reputation, fine products, etc. Am I missing something? One of my first moves as an DIY investor was to buy shares of JNJ. It goes back to 2010. I bought its shares at around 60$. I will hold these stocks for as long I possibly can. JNJ represents more than 10% of my portfolio. It's a lot but I am confortable since it's such a great company. Imagine, I had 200 shares at some point. Now I own 130 and I don't want to sell more just to keep my % lower than 10. These shares are here to stay. Of course, the exchange rate with the Canadian dollar has helped me quite a bit. 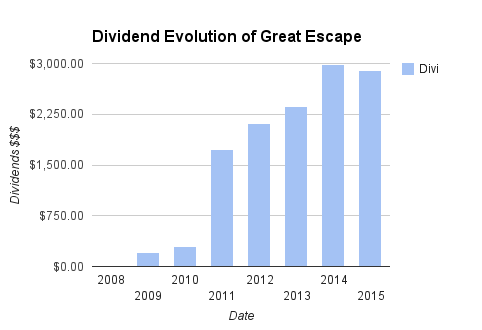 This company does not fit my typical dividend investing profile. It's a small-mid-cap growth company. It pays out a meagre dividend. But the potential is there. So I bought 30 shares at 29$, thinking I was probably buying it too high and that I would buy some more later at a lower price. Little did I know. The share quickly rocketed to a 50$ price. It has gone down recently to 44-45$. I bought 15 more shares. I now hold 45, which is not a lot. But I am happy still happy I got on. I think the future is promising for ATD.B. These two guys are twin brothers in some ways. POW is the all-around conglomerate. PWF is the financial Branch in some ways. You can buy both, depending on what your preferences are. If you want to own the whole Desmarais Family Empire, you go the easy way with POW. If you are only interested in Insurances and Financials, you pick PWF. I own the two. The reason is simple : I had too many POW shares and wanted to lessen my exposure to their Communication Branch . They hold most of the newspapers in Quebec, as well as many other communication companies. POW also holds and actively manages a portfolio of investments in China and Europe. These two companies are huge :Great West, IGM Financials, Irish Life, Canada Life and so on, to name a few. Power Financial, through its wholly owned subsidiary, Power Financial Europe B.V., and the Frère family group of Belgium each hold a 50% interest in Parjointco, a Netherlands-based company. Parjointco’s principal holding is a 55.6% equity interest in Pargesa Holding SA, the Pargesa group’s parent company based in Geneva, Switzerland.The Pargesa group, through the holding company Groupe Bruxelles Lambert, holds significant positions in large companies based in Europe such as Lafarge, Total, GDF de Suez and Pernod Ricard. It really beats me that I don't see more Canadian investors actually holding one of these stocks. 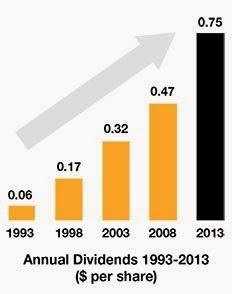 I know they haven't raised their dividends in quite some time now (since 2008). But these are very careful run company. They don't get carried away easily. 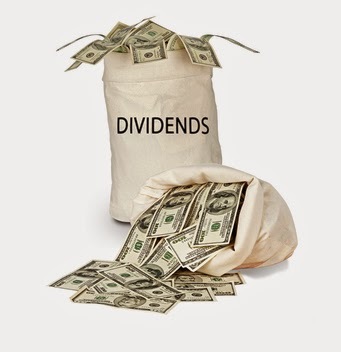 Besides, at roughly 4%, they actual dividend yield is very much acceptable. What do you think of my other top 3 stocks? Do you hold any of these stocks? When contemplating the road traveled and the now value of my Portfolio, I can't believe how relatively easy it was to build that stack of money. We read about it over and over, but it's true : you can build wealth with a relatively small income. And one thing is absolutely certain: the sooner you start, the faster your money will grow. Compounding interest is not magic ocus-pocus formula. It's a reality. Start young, invest on a regular basis and time will do the rest (that and a few strong bull market). We also read a lot about people regretting not investing earlier. I get that too. But why bother : what's done is done. You can only make up the time you lost. I often tell myself that I could of done much better if I had only did this and that... Well I didn't. Fact is, at the time, the things I was doing with my money were the things I thought appropriate to be doing. That's all. Eating out, traveling, spending dough on useless crap... Those were the thing to do back then. I still have to tap on my shoulder and congratule myself for having the presence of mind to invest small amount of money in those expensive mutual funds from 2000 to 2007. That money wasn't working hard, but thankfully it wasn't spent for nothing. I'm so glad that I got to know what I know now. Otherwise, I wouldn't have taken the steps to engage on this road to be financially independent. So, all in all, no regrets. Just happy to be where I am now. I guess the chart below pretty much sums up where I am coming from (and where I intend to go). It's never too late to do good things, people say. I guess there's some truth to it. And you, do you have any financial regrets? How did you overcome them? * Notice things haven't changed much between 2011 and 2012. It's because I bought a house. Therefore I wasn't able to invest as much as I would have liked to. But hey! it's an investment, right?